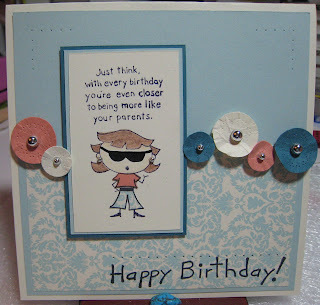 I made this card the other night, but I figured I would let Blogger post it for me while I'm out of town. I stamped the large image from the Fresh Cuts set on the large Pumpkin Pie flower. I don't know if I like it...it just makes the flower look dirty. 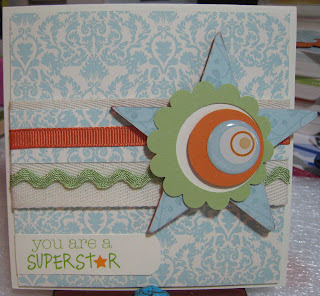 I also stamped that same stamp on the scallop circle and the chipboard button. Since the chipboard has glossy paper, I stamped it with gold Brilliance ink. I love Brilliance inks. The only adhesive I used on this card is holding the flower layers together. 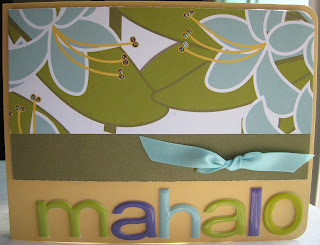 The brown textured paper and the ribbons are sewn onto the cardstock. I had the sewing machine out since I was hemming some new shirts, so I figured I should use the machine on a card. My old sewing machine is on its last leg, plus it only does a straight stitch. I could use a new one! As a kid, I loved holograms. As an adult, I still love holograms. When I saw this gift card at Target, I had to get one for my niece Alyssa. She's turning 10 soon. 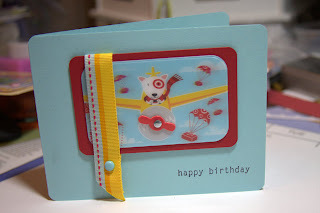 Since I had to make this card quick, I decided to use the gift card as the focal point of the card. Super fast! I'm in a rush to pack, but I need to create 3 cards before we leave. Three nieces are celebrating birthdays in the next few weeks. We fly out bright and early tomorrow morning. This card is for Analisa who turns 18 on Aug 6th. I like gift cards...receiving and giving. I don't know how to shop for girls anymore, so this gift is a no-brainer. I wanted to design a card around the gift card. 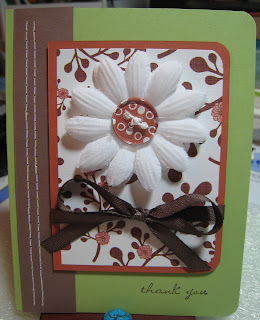 This card started with some BasicGrey paper that is part of a Matchbook Kit. I rubbed the raw chipboard with Rose Red ink. The matchbook flap is attached to the pink cardstock with eyelets. The paper on the inside of the flap is yummy. I got it from my local scrapbook store. It it almost like cloth. I can't remember who makes it. This is something fun to try out. Go to Wordle and enter your blog's URL. These are the results (a word cloud) for my blog. I'm surprised Rose is the most prominent word. I went to bed last bothered by the amount of Sage Shadow on my previous card for Kristina's Color Inspiration Challenge. Yes, I'm a little obsessed! Today, I got a piece of white cardstock and stamped it with the same stamp from Fresh Cuts and then I embossed it with white embossing powder. I rubbed Rose Romance (I don't have Regal Rose) on the embossed image and wiped away the excess ink. I slipped the new layer into my old card, and Voila! I like the card much better now and I didn't have to take anything apart. The Sage Shadow is still there, but it's just a small border. Sorry for posting twice. Edited to Add: I updated this card this morning. Here's the new version. I loved the vintage dress that inspired this week's color challenge from Kristina. I rotated Taylor's sketch on it's side. 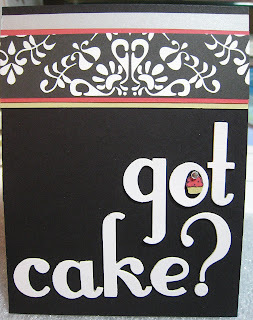 Two nieces will be celebrating birthdays in a few weeks, so this card is for one of them. I paper pieced the clothing. I paper pierced the circles and main layer. I also liked the look of distressing the circles. I noticed Dawn McVey does this. I love the look. I used a Sakura Glaze Gelly Roll pen on the sunglasses to give them a shiny look. We are flying to New Mexico in 2 weeks. Kalino will turn 5 while we are visiting my family in Taos. 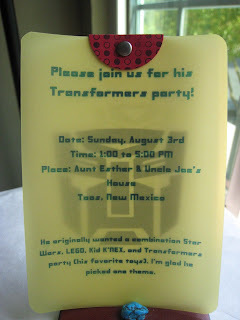 Just recently, he decided he wanted a Transformers-themed party. Originally, he wanted a Star Wars, LEGO, Kid K'Nex, and Transformers party. Colin Cowie, how would you put all those themes together for one bash? Yikes! 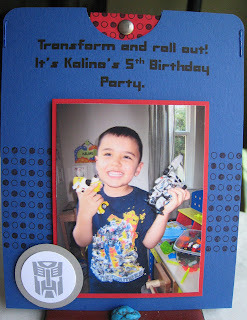 Lucky for me, he narrowed his choice down to Transformers...it's more like I coerced him into choosing just one theme. I could've bought some invitations at Party City or Toys R Us, but I wanted them to be custom. We haven't been to New Mexico in almost a year, so I wanted the invitation to have a picture of Kalino. In the photo, he's wearing a Transformers t-shirt and playing with 2 of his many Transformers. The first line says "Transform and roll out! It's Kalino's 5th Birthday Party." I downloaded a free Transformers font (actually, I downloaded a few versions first to compare them). There are many sites that have a version of this font. It's a little hard to read... a small "a" can look too much like an "o", but I had to use this font. The Autobot logos were actually symbols that came with the free font. I just enlarged them. I used the SU printer-compliant codes to print the logos in Going Gray on white cardstock. The text on the vellum was printed in Brilliant Blue, but it doesn't look the color since I printed on colored vellum. The sleeve of the invitation is a 4.25" x 11" piece folded in half. The insert is 3.75" x 5". 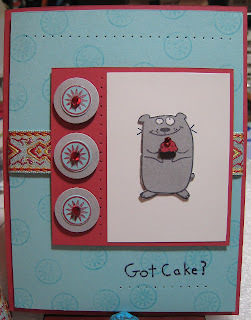 This card was simple, but I had a few Stickles accidents. Ugh! I had to re-piece the hippo and the scallop. I should been working on birthday party invitations for my son, but I had to participate in Taylored Expressions Cupcake Challenge #24. Naomi from Bertie Bird is Best gave me this nice award. Gracias, Naomi! I'm familiar with Naomi's work because she's done Kristina's color challenges. Last week, she was included in the Top 10. I recently got a separate award from Jen Tapler. There is so much incredible talent out there that I have a hard time picking just 7 talented people, so I'm not going to choose anyone right now...sorry, for breaking the rules. I'm glad to see Really Rust in the mix. I never use that color! This is the first time I've had all the inks and all the cardstock colors! This is like the 3rd version of this card. I couldn't make up my mind, plus a ruined a rub-on. This card started with the ribbon. 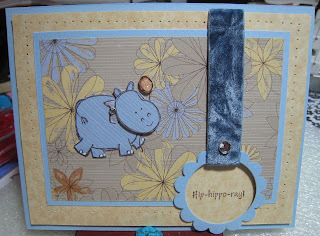 I've got some yummy BasicGrey ribbon I was itching to use. The sketch I used is for Taylored Expressions Cupcake Challenge #23. Oh, wow! I love this color challenge, because I love black and white! Kristina asked us to create a "high-contrast, bold creation". Well, I hope I've done that. I literally put the Thickers on the cardstock first and worked backwards from there. I finally bought Thickers a few weeks ago. I didn't add ribbon because I wanted to keep the card masculine. This is the Thank You card I made for Jenn. It came together pretty quickly. There was no stamping involved. I found these cool shiny Making Memories sticker letters on sale at Michael's last week and I was itching to use them. Earlier this week, I got a nice surprise in the mail from Jenn (Kiyomi Krafts). Kalino was thrilled that he got a gift too (bubble machine). The card she sent is gorgeous. I love the way she gives punched flowers 3 dimensions. Mahalo, Jenn!